How to record a narration to play. This process also works in PowerPoint 2013 & 2010. Step 1:Plug in headset (we have some for loan at the Help Desk in Nicarry 125)Step 2:Make sure the microphone is working. Under Control Panel, Select Hardware and Sound, Click Sound, Select Mic and go through the configuration. Step 4:In Record Slide Show dialog box, select the Narrations and laser pointer check box. Select or deselect Slide and animation timings check box. Click Start Recording. Step 5:To pause recording at any time, click Pause icon in recording panel. 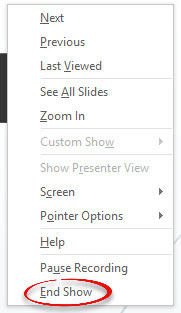 Step 6:To move to next slide, right click on the slide and choose Next. 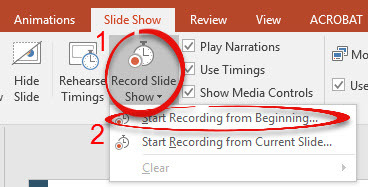 Step 7:To end recording, right click on the slide and choose End Show. Step 1:In Normal view, hover over the sound icon on the slide. Step 2:Click Play to preview the sound.